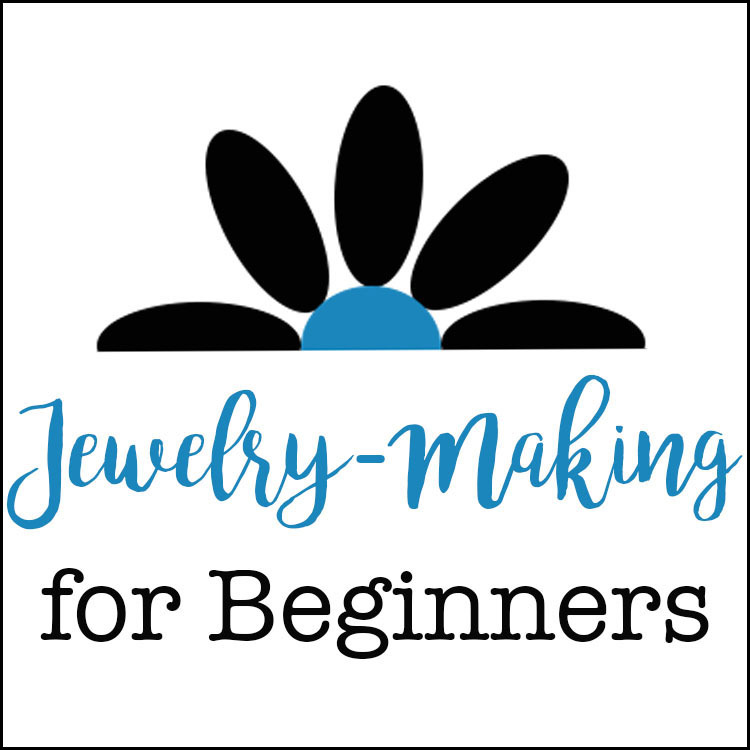 Basic jewelry-making is a hobby that I believe anyone can learn. Sometimes, all it takes is the right equipment and a little explanation. I'm hoping to provide that to you in this series of posts. Previously, I went into details about the tools needed to begin making jewelry. In this second lesson, I'm going over some of the materials used to make jewelry. 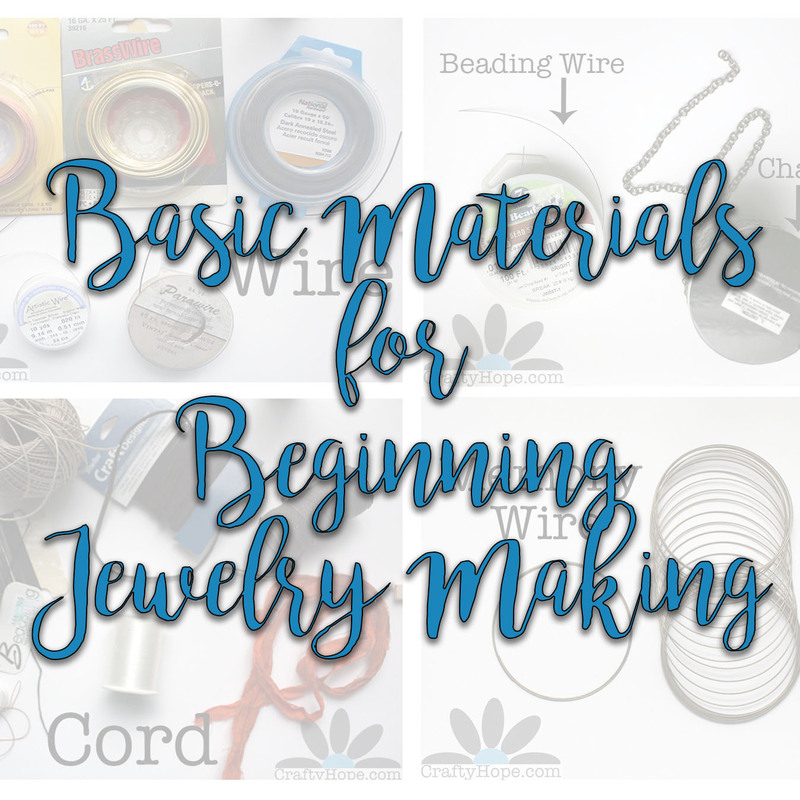 Like the first part of this series, I also made a video of these Jewelry-Making Basic Materials if you'd rather watch than read, or if you like to do both. Now for my explanation on jewelry-making materials. Wire: I only begin with this because it's my personal favorite material. Wire comes in a variety of metals, colors, and shapes. I've found round wire, flat wire, square wire, half-round wire, twisted wire, and so on. In addition, there are several choices in wire hardness. However, you'll find this option most often with higher-end wire. It typically ranges from dead soft to half hard wire, with dead soft being more pliable. One of the most important things I can tell you about wire is that it is sized by gauge. The smaller the gauge of wire, the thicker the wire. For example, 16 gauge wire is thicker than 24 gauge. 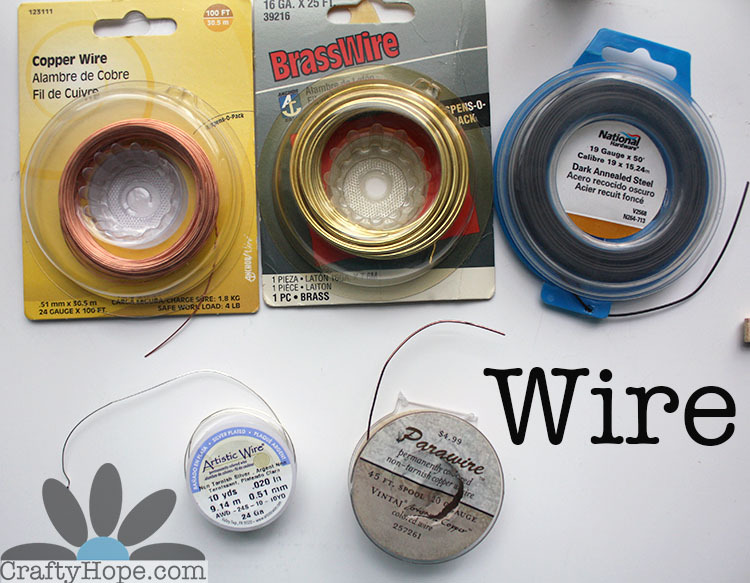 Keep in mind what you'll be using the wire for before selecting the gauge. 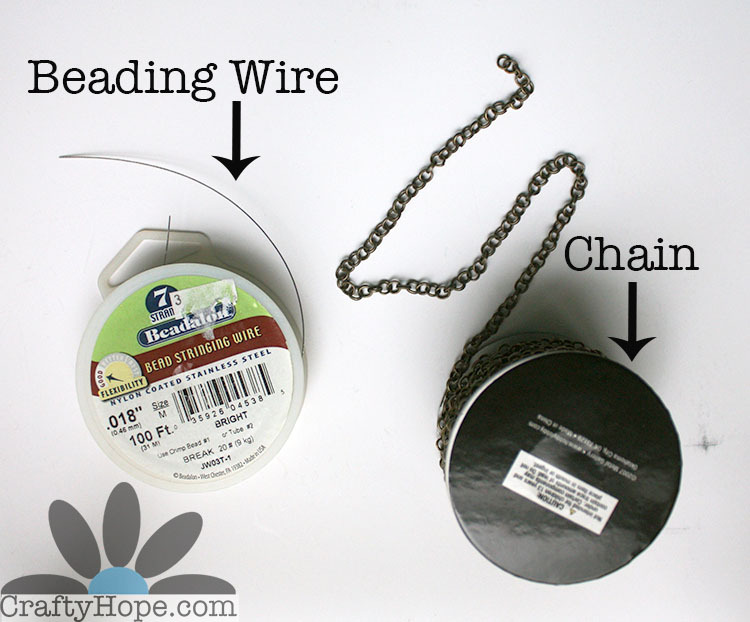 You can purchase wire from craft and bead shops, but I often get mine straight from the hardware store. Wire is useful for making beaded chain, ear wires, clasps, bangles, wire-weaving, stone wrapping, and much more. Chain: This is probably the most basic of all jewelry-making materials. Chain generally consists of links of metal or other material connected to one another. It's perfect for simply adding charms or a focal piece to easily make a completed piece of jewelry. As well, chain makes a great accent like tassels or helps extend too-short pieces. Beading Wire: Also called bead stringing wire, beading wire is a material created especially for jewelry-making. It comes in spools and is made of tiny, twisted wires coated with nylon. The nylon helps protect the wire and extend the life of your projects. Beading wire is most often used in conjunction with crimp beads to create necklaces and earrings. It can be found in a variety of sizes and colors. Cord: This is probably the widest section of jewelry materials. 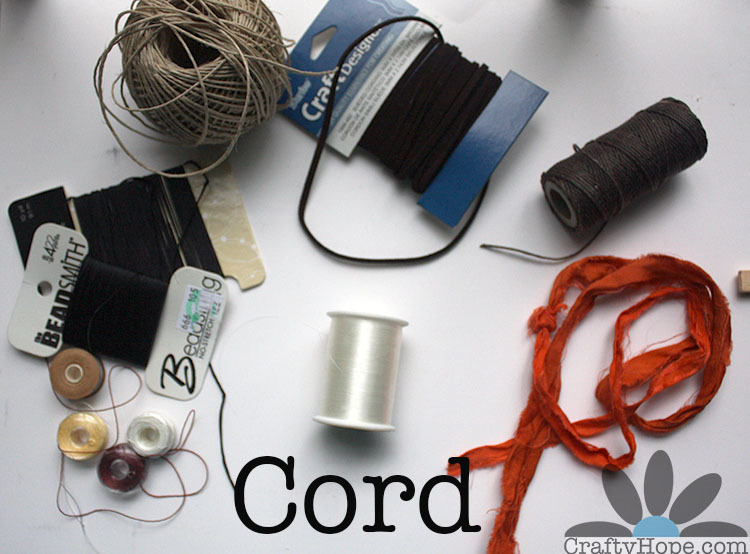 Cord includes waxed linen cord, beading thread, sari silk ribbon, leather cord, invisible nylon cord/thread, hemp, and many, many more. Waxed linen is waxed to increase its durability and workability. It (as well as hemp) are often used with knotting/macrame techniques. Beading thread is intended specifically for jewelry-making. Most often, it's used with seed beads for tiny, intricate work. Invisible nylon cord is much like fishing line (which I have used before) and usually used when you want the material to be as invisible as possible. Of course, each of these cords has a great many uses beyond the ones I've mentioned. Memory Wire: I almost left this one out of the video, and it's one of the simplest to use. 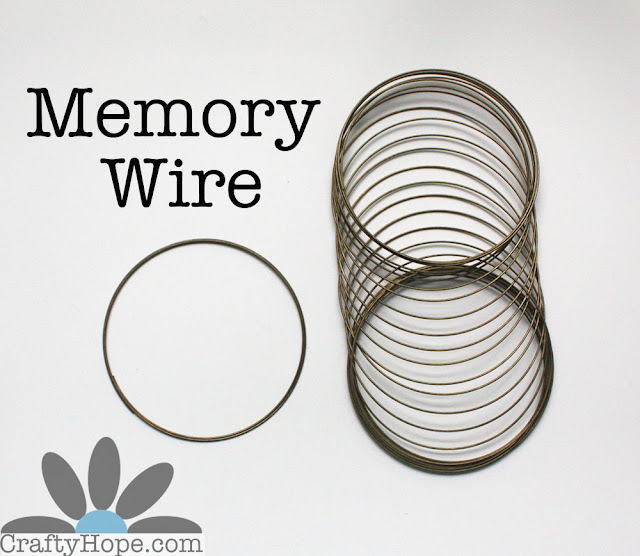 Memory wire comes in a coil and retains its shape, hence the name. When pulled, it springs back into shape like a slinky. I've found ring, necklace, and bracelet memory wire; but the bracelet shape is by far the most popular. It's most often found in a silver-tone, but other metal tones are also out there. A material I've left off this list is Elastic. It's not something I use or keep on hand. I admit that I have trouble tying the elastic to my satisfaction, even with glue. As well, much of the jewelry I get from friends to fix are bracelets that have been strung on elastic and have popped. It's simply not a reliable material. As such, I don't use it personally. I know that I've omitted a ton of more in-depth details about each of these materials, but this should sum it up for those just starting out. However, if you've got something to add or have questions, please don't hesitate to let me know in the comments. Linking up at Sweet Inspiration Link Party, Dare to Share Saturday, and Saturday Sparks Link Party at Pieced Pastimes. I’m a jewelry-artist, treasure hunter, & nature-lover that finds joy in the smallest things. I hope to spread that joy and inspiration. Great tutorial! Getting started is overwhelming when you want to try a little bit of everything. I feel the same about elastic. It scares me since it can easily break if caught on something. I used it when I first started making jewelry but I never heard from any customers of breakage but I always wondered! Thank you so much, this is really useful for me because my daughters want to make jewelry and I have no idea what we need. Pinning! Thanks for stopping by! It means so very much to me. I love to hear what you have to say.